In product development news, DELEC has partnered with Intracom Systems and its leading IP Software Matrix Intercom, VCOM. 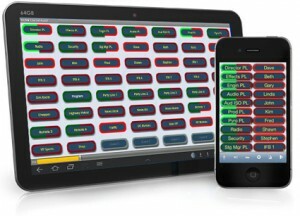 VCOM virtual panels can be used for both DELEC oratis and oratis compact intercom systems and digital PA. The system has the advantage of both flexibility and portability as it works over internet connections on iOS, Android and Windows, even on 3G/4G networks! VCOM virtual panels combined with oratis intercom systems or digital PA offers users low latency audio codec and high bandwidth audio. The system also supports full paging panel functionality including; intercom between phones and panels, conference rooms with up to 256 ports, the ability to listen to any source within the system and the ability to control GPOs, routes and audio levels. The VCOM system integrates to both DELEC MF4 and CS Systems via Dante and has a centralised server design (up to 64 ports per server). The system also supports external microphones and headphones/headsets. The oratis system with VCOM virtual panels is currently being used on some of Sydney Trains’ stations. For more information on this type of system, please contact STAGETEC MEDIAGROUP Australia.